Alpacas are part of the Camelid Group including Camels, Llamas, Alpacas, Guanacos and Vicunas. Alpacas are native to the Andes Mountains of South America, primarily Peru, Bolivia, and Chile. They were first imported to the United States from Bolivia in 1984. They have been domesticated for over 5000 years. The finest alpaca fleece was reserved for the Incan Royalty and has been known as "The Fiber of the Gods". 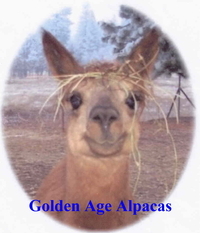 The ARI, The Alpaca Registry, Inc., was formed in 1989 and maintains a registry of pedigrees through DNA testing. There are two types of alpacas: Huacaya, pronounced wah-ki-yah and Suri, pronounced surrey. Huacaya fiber is dense, crimpy, and gives a wooly appearance. Suri fiber is silky and resembles pencil-like locks. An average life span is 20 years. 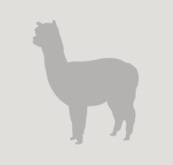 Average weight for an adult alpaca is 150-170 pounds. Average height is 36 inches at the withers. They have padded feet (like a dog) with two toes. They have teeth on their bottom jaw and a hard dental pad on top for grinding their food. They are semi-ruminants, have three stomach compartments and chew a cud. They are alert, intelligent, and curious. They are social animals and require at least one companion. They communicate by humming and an array of other vocal noises along with body posturing. They do spit---at each other---another form of communication, usually at feeding time to determine position. Average gestation is 11 months. They have single births—twinning is rare. Females are generally ready to breed at 18-24 months. Males are generally ready to breed at 2-3 years. Females are induced ovulators, which means breeding stimulates ovulation. Females usually give birth during daylight hours (6am to 3pm). Alpacas are easy keepers, requiring pasture, good grass hay, and pellet supplementation. A three-sided shelter is enough protection from the elements. They need routine nail trimming, de-worming, and sometimes teeth trimming. Fencing is more to keep predators out, not alpacas in, as they do have a respect for fences. They do, however, love open gates! They are shorn once yearly, usually in the spring or early summer in our part of the country. They will then be cool for the summer months and grow back enough fleece by the time cooler weather returns. They use a common dung pile, which makes clean up easier. The manure is great fertilizer and does not burn, so can be used right from the animals to the flowerbed and garden.